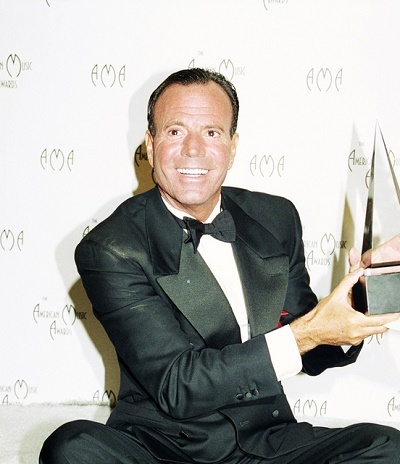 Julio Iglesias is a Spanish singer and songwriter. He is the son of Julio Iglesias Puga and María del Rosario de la Cueva y de Perignat. His father was born in Ourense, Galicia, Spain, and was a prominent gynecologist. He is married to Dutch model Miranda Rijnsburger. He has five children with Miranda, and three children, including singer, songwriter, and actor Enrique Iglesias, with his former wife, Filipino-born journalist, socialite, and television host Isabel Preysler. The surname Iglesias is Spanish for “churches.” Julio’s paternal ancestry comes from Galicia. Julio has stated that he has, or that he thinks he has, some degree of Sephardi Jewish ancestry on his mother’s side. It is not clear if this ancestry has been documented/verified. Julio’s recent ancestors were not Jewish. Julio’s mother’s surname, de la Cueva y Perignat (literally “of the cave”), referring to Jewish people in hiding, is evidently a common Jewish name. Julio’s paternal grandfather was Ulpiano Iglesias Sarriá (the son of Juan Iglesias and Carmen Sarria). Ulpiano was born in Ourense, Province of Ourense, Galicia, Spain. Julio’s paternal grandmother was Manuela Puga Noguerol (the daughter of Elías Puga de la Torre and Elisa Noguerol Buján). Manuela was born in Ourense, Province of Ourense, Galicia, Spain. Elías was the son of Manuel Puga and Manuela de la Torre. Elisa’s mother was Asunción Buján. Julio’s maternal grandfather was José de la Cueva y de Orejuela (the son of Manuel de la Cueva y Campo Redondo and Rosario de Orejuela y Prieto). José was born in La Palma, Huelva, Andalucía, Spain. Manuel was the son of Fernando de la Cueva Cáceres and Manuela Campo Redondo Íñiguez de Tejada. Rosario was the daughter of Francisco de Orejuela y Placer and Tomasa Prieto y Fernandez. Julio’s maternal grandmother was Dolores Perignat y Ruiz de Benavides (the daughter of José Mariano Eleuterio Gavino de la Santísima Trinidad Perinat y Ochoa and Manuela Ruiz de Benavides y Pérez). Dolores was evidently born in Guayama, Puerto Rico (of Spanish descent). José was a Spanish military officer, from Seville, Seville, and was the son of Juan Luis José María de los Dolores Perinat y Salvadores and María Teresa Ochoa y Correa. Juan’s paternal grandparents, Jean Nicolas (or Juan Nicolás in Spanish) Perinat and Marie Marguerite (or María Margarita in Spanish) de la Coste, were French, from Paris. Correct Fernando de la Cueva’s maternal family name to Cáceres. Manuela’s maternal family name is Íñiguez de Tejada. Dolores was the daughter of José Mariano Eleuterio Gavino de la Santísima Trinidad Perinat y Ochoa and Manuela Ruiz de Benavides y Pérez. José was a Spanish military officer, from Seville, Seville, and was the son of Juan Luis José María de los Dolores Perinat y Salvadores and María Teresa Ochoa y Correa. Juan’s paternal grandparents, Jean Nicolas (or Juan Nicolás in Spanish) Perinat and Marie Marguerite (or María Margarita in Spanish) de la Coste, were French, from Paris. And, you should not omit Manuela’s paternal family name. Kindly put it back, please. Ulpiano was the son of Juan Iglesias and Carmen Sarria. Manuela Puga was the daughter of Elías Puga de la Torre and Elisa Noguerol Buján. Elías was the son of Manuel Puga and Manuela de la Torre. Elisa’s mother was Asunción Buján. Julio’s father were born in Ourense, Galicia, Spain, and was a prominent ginecologist. Sorry, if this interview was already linked. Ok. Natasha Leggero’s father is John Leggero.